It takes many small things to make something big. Best Small Fictions 2016 is seeking nominations from around the world. The deadline for nominations for international submissions (Best Small Fictions is based in the United States) from editors and presses is fast approaching: postmarked by Monday, January 11, 2016. In 2015, fifty-five acclaimed and emerging writers—including Emma Bolden, Ron Carlson, Kelly Cherry, Stuart Dybek, Blake Kimzey, Roland Leach, Bobbie Ann Mason, Diane Williams, and Hiromi Kawakami—made the debut of The Best Small Fictions series something significant, something worthwhile, and something necessary. Featuring spotlights on Pleiades journal and Michael Martone, this international volume—with Pulitzer Prize–winning author Robert Olen Butler serving as guest editor and award-winning editor Tara L. Masih as series editor—is a celebration of the diversity and quality captured in fiction forms fewer than 1,000 words. 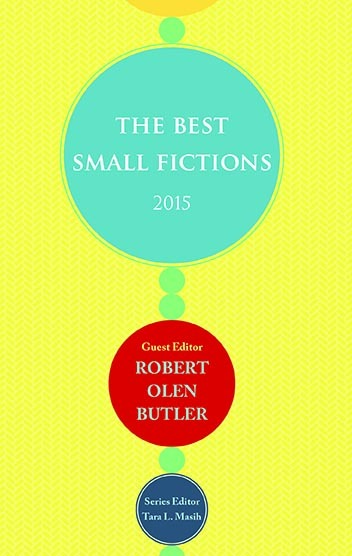 Best Small Fictions 2015 is available on Amazon UK. Writing from journals as varied as Matter Press, Wigleaf, The Stinging Fly, Workers Write!, Contemporary Haibun Online, Neon Literary Magazine , Smokelong Quarterly, Flash Frontier, Sand, decpomP, The Los Angeles Review, Bartleby Snopes and Gargoyle were included in the 2015 volume—and that’s just a sample. Coming in October 2016, the second volume, guest edited by Stuart Dybek, promises the same excitement and depth as the first. The editors are especially looking for nominations by international writers. More information and reviews can be found on The Best Small Fictions page on Facebook. And please nominate for the 2016 volume!